We apply the EMF 23 study design to simulate the effects of the reference case and the scenarios to European natural gas supplies to 2025. We use GASMOD, a strategic several-layer model of European natural gas supply, consisting of upstream natural gas producers, traders in each consuming European country (or region), and final demand. Our model results suggest rather modest changes in the overall supply situation of natural gas to Europe, indicating that current worries about energy supply security issues may be overrated. LNG will likely increase its share of European natural gas imports in the future, Russia will not dominate the European imports (share of ~1/3), the Middle East will continue to be a rather modest supplier, the UK is successfully converting from being a natural gas exporter to become a transit node for LNG towards continental Europe, and congested pipeline infrastructure, and in some cases LNG terminals, will remain a feature of the European natural gas markets, but less than in the current situation. 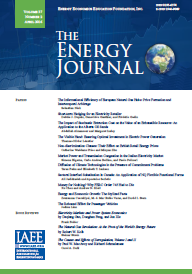 Published in Volume 30, Special Issue of The Quarterly Journal of the IAEE's Energy Economics Education Foundation.